Be the first to share your favorite memory, photo or story of Mercedes "Marsha". This memorial page is dedicated for family, friends and future generations to celebrate the life of their loved one. 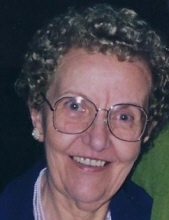 Mercedes “Marsha” (Liss) Meyer, 96, of Peru, passed away Friday, April 5, 2019 at Heritage Manor, Peru. Mass of Christian Burial will be 10 a.m. Wednesday, April 10, 2019 at St. Joseph Church, Peru with Monsignor Richard Soseman, pastor officiating. Burial will follow at St. Hyacinth’s Cemetery, LaSalle. Visitation will be from 9 a.m. to 9:50 a.m. Wednesday in the church. Arrangements have been entrusted the Mueller Funeral Home, Peru. Mrs. Meyer was born on July 9, 1922 in LaSalle to John and Pearl (Tomaszewski) Liss. She married Walter Meyer on July 5, 1947 in St. Hyacinth’s Church, LaSalle. She worked for Westclox, Peru for 8 years and was a homemaker. She was a member of St. Joseph’s Church, Peru and the churches Altar and Rosary Society. She is survived by her three sons, Gilbert Meyer of Peru, Ronald (Jan) Meyer of Madison, WI and Richard (Fay) Meyer of Silt, CO; three grandchildren, Adam, Kelly, Abigail and four great-grandchildren; and one brother, Rev. Anthony Liss of Dubuque, IA. She was preceded in death by her parents; her husband; one granddaughter, Rachel Meyer; and 5 sisters. Memorial Contributions may be directed to St. Joseph’s Church, Peru for memorial masses. To send flowers or a remembrance gift to the family of Mercedes "Marsha" Meyer, please visit our Tribute Store. "Email Address" would like to share the life celebration of Mercedes "Marsha" Meyer. Click on the "link" to go to share a favorite memory or leave a condolence message for the family.